This super simple lunch idea will definitely be something you’ll be sure to make over and over. For the cherry dressing simply put all the ingredients in a saucepan, bring to a boil and reduce heat and simmer. Describe it as, once you can’t smell the alcohol anymore it’s ready! Take it off the burner and let cool. As it cools it will gradually thicken. Pan fry the moose until desired done-ness. If you are like me and you like your meat not kicking anymore, then simply remove the meat just before its cooked all the way through. If it’s sliced thinly it will continue to cook after you take it out of the pan and will be the exact done-ness and will be nice and tender. Next up shave your vegetables. 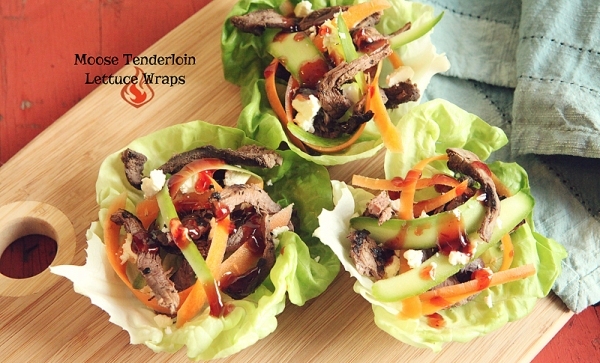 Grab a potato peeler and shaved off nice strands of carrots and cucumbers to add in to the lettuce cups. If you prefer them chopped or grated, by all means go right ahead! Place your butter lettuce leaves on a plate and begin to assemble and alternated between moose and veggies, crumble feta cheese on top and drizzle the Honey Cherry Dressing on top. Make as many lettuce cups as you’d like depending on how much meat you used!